ISO 17100:2015 provides requirements for the core processes, resources, and other aspects necessary for the delivery of a quality translation service that meets applicable specifications. 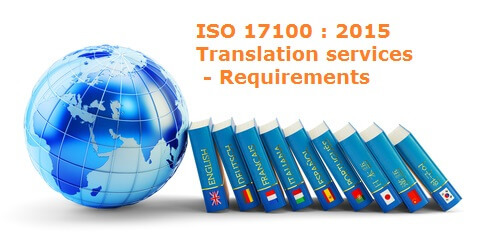 Application of ISO 17100:2015 also provides the means by which a translation service provider (TSP) can demonstrate conformity of specified translation services to ISO 17100:2015 and the capability of its processes and resources to deliver a translation service that will meet the client's and other applicable specifications. Applicable specifications can include those of the client, of the TSP itself, and of any relevant industry codes, best-practice guides, or legislation. The use of raw output from machine translation plus post-editing is outside the scope of ISO 17100:2015. ISO 17100:2015 does not apply to interpreting services.